Let us introduce you to the efficiency and comfort of our film wrapping solutions. Blisters, syringes, vials and tubes - our machines wrap the entire pharmaceutical product range. The modular architecture is flexibly expandable and open for all types of film wrapping, from stretchwrapping to shrinking, stretching and full overwrapping. Rely on our customers' experiences: more than 450 integrated track & trace systems, all from reputable T&T suppliers, provide protection for the authenticity of your products. Trust in pure pharmaceutical competence from the very start. Economical, flexible and pharmaceutically safe. Benefit from an advanced cutting-edge sealing technology that has been a proven success in daily pharmaceutical use throughout the decades. Join us as we go the extra mile. Experience the cutting-edge, sustainable machine design specifically created for future pharma requirements. 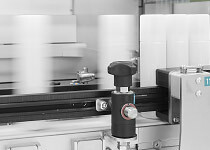 The high-speed stretchwrapper in our new Compact series bundles, pharmaceutical folding cartons with unique precision and reliability. Experience a new element in product safety and operating comfort.